The evening starts as hula dancers welcome you aboard the Ali’i Kai. Once aboard, the staff looks after you as if you were family, so sit back, relax and let the house band entertain. 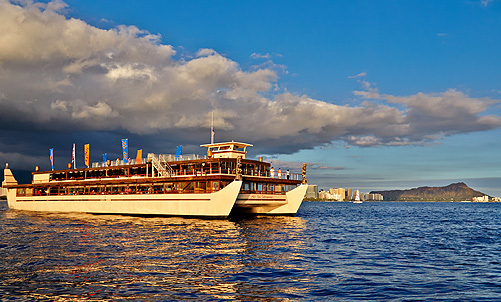 Take in the sunset as you sail along the coastline and view the city lights from the main deck or the bridge above. 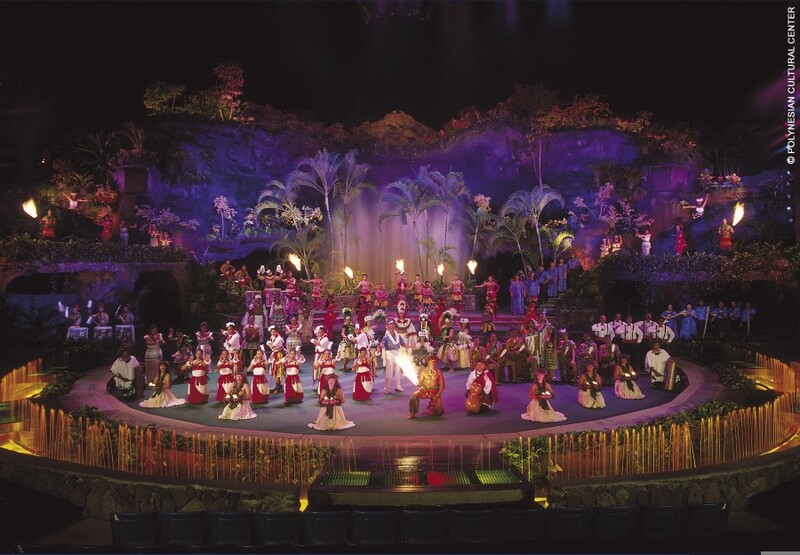 As you enjoy your dinner, dancers, chanters and drummers will entertain you with the story of the Polynesian islands. Following dinner, join the dancers as they invite passengers onto the floor and lead dances from around the world – folk, rock, line dancing and Hawaiian hula. 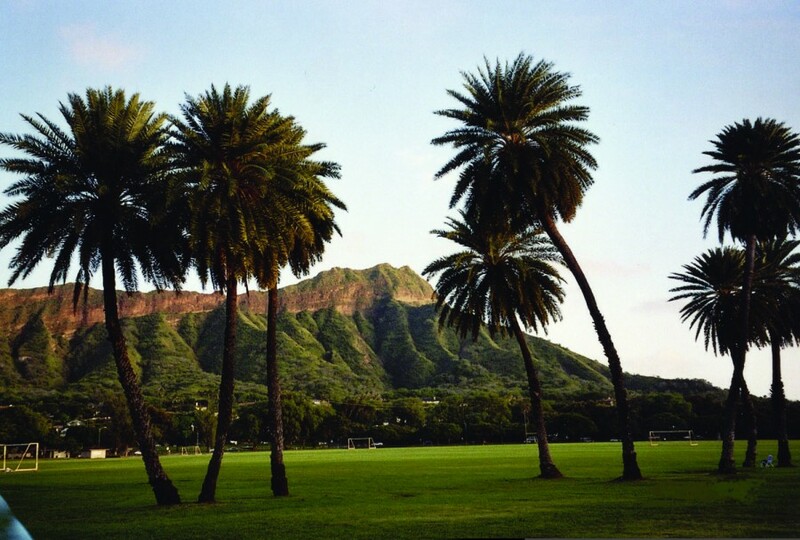 Begin a hike that takes you up to the pinnacle of Diamond Head, an extinct volcano. The hike is about 3/4 of a mile up a fairly steep grade. You may want to bring some water for this journey. 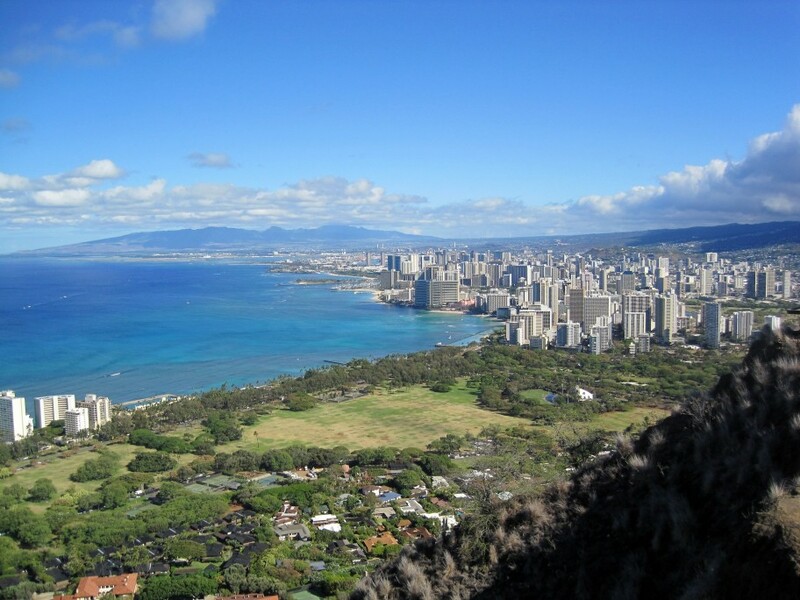 Often windy and always beautiful, this perch gives you an unobstructed view of Waikiki Beach and downtown Honolulu. *This optional activity is regulated by the State of Hawaii; permits are required at 60 passengers per permit, with 2 hours between each permit time. The cultural center is Hawaii’s #1 attraction and an awakening to the senses! Here you can explore seven fascinating Polynesian cultures in their unique villages throughtout a 42-acre park. Learn to hula, taste the native root plant “poi”, listen to the beat of the Tongan drummers, and watch the Samoans climb trees and make fire. Most groups choose to stay for the buffet dinner and the award-winning evening show featuring over a hundred performers from across the Pacific, drums, dance, all new music and special effects, a fire-spewing volcano and a world-renowned fire knife performance. The Pavilion’s main attraction is the store selling “pineapple” everything! In the pineapple garden you can see the various kinds of pineapple being grown and learn some fun facts. 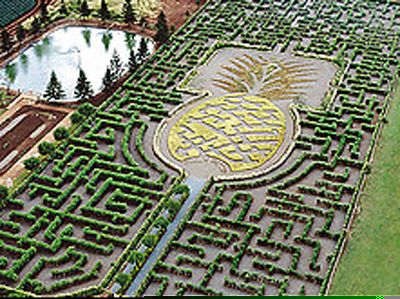 The Pavilion dares you to attempt the World’s Largest Pineapple Garden Maze (admission required). Stroll through the Hawaiian Village and learn the arts & crafts of the islands or test your skills in traditional Hawaiian games. Participate in the Hukilau on the beach and learn the net fishing techniques of old Hawaii. Witness the time-honored techniques of underground oven cooking at the Imu Ceremony. 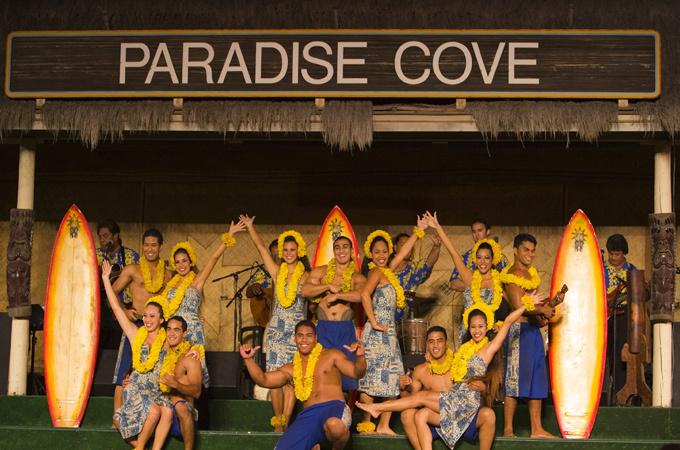 Enjoy Paradise Cove’s extensive menu which features the best of traditional Hawaiian dishes. With the most spectacular Hawaiian sunset as a backdrop, award-winning performers will entertain you with an unforgettable display of songs and dances of Hawaii and Polynesia. Take a 40-minute drive around to the unpopulated side of the island to a botanical garden with an 800-year-old fishpond. Once there, continue onto the secret island by pontoon boat. You can have a BBQ lunch on the beach and there are all sorts of activities to choose from. 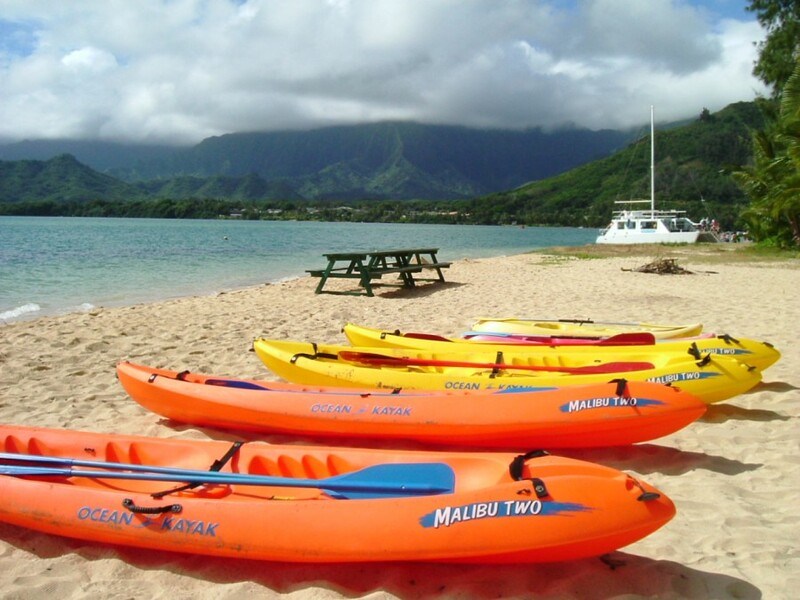 The island offers you volleyball, snorkeling, canoeing, kayaking, swimming, tug-o-war and more. It’s a great day in the sun! This includes a fully narrated tour through historic Honolulu. Sites include Punchbowl National Cemetery of the Pacific, Iolani Palace, State Capitol, Washington Place, King Kamehameha Statue and the Kawaiaha’o Church and Mission Homes. 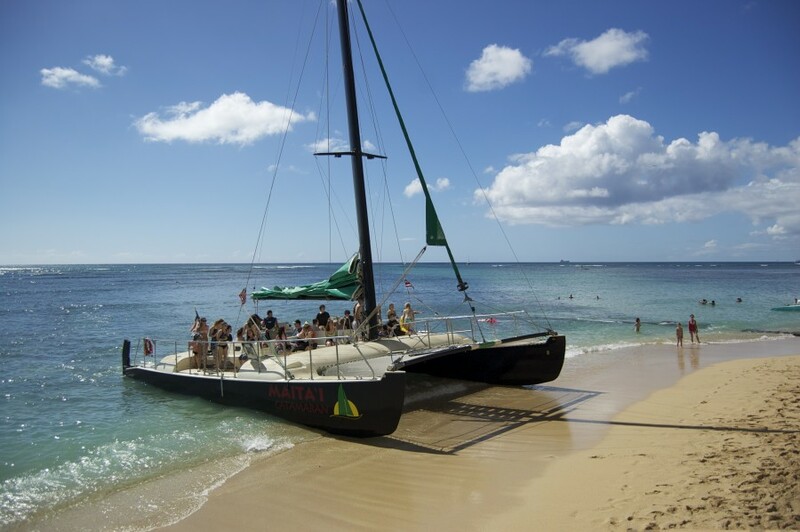 Set sail on the blue waters of Hawaii and create lasting memories as you cruise the coast. Depending on the time of year, you may even see dolphins, whales, and sea turtles.